BUY SHOWCASE TICKETS NOW! You don’t want to miss this amazing and empowering show! Please spread the word on Facebook and pack the house for our campers!! Comments Off on Showcase Poster! REGISTER NOW for CoMo Girls Rock Camp 2017!!! Camp will be at Stephens College June 5-9th with the showcase at The Blue Note on June 10th. Camp is $229 with financial aid available. Please e-mail us at comogirlsrock@gmail.com for more information! We are so excited for our 5th year of CoMo Girls Rock!!! Please help spread the word to any potential campers you know! And we only have 25 spots, so register early!! CoMo Girls Rock! is dedicated to empowering self-identified girls, and gender non-conforming and/or trans youth, ages 12-18, through creative expression, musical exploration, and social awareness. The many volunteers that run this camp provide mentorship and facilitate a space for campers to be themselves. Throughout the week, campers will learn an instrument (no experience necessary! ), start a band, and write an original song. There will also be DIY crafts, live concerts, meaningful workshops, the occasional dance party and more! The camp culminates on Saturday with a live rock show at The Blue Note featuring performances of campers’ original songs. Comments Off on It’s Time for Camper Registration! Apply to be a 2017 CoMo Girls Rock camp volunteer! Our volunteers are a dedicated team of self-identified women, and gender non-conforming and/or trans adults over the age of 18. We have positions for musicians and non-musicians, the week of camp (June 5-9) and the weekends before and after! The deadline to fill out the application is March 24th so please help us spread the word and e-mail us if you have any questions!! Comments Off on 2017 Volunteer Application! CoMo Girls Rock Camp 2016 is June 6-10 at the Columbia Area Career Center, culminating at the camper showcase on Saturday, June 11th at the Blue Note at 2pm!! The camper application is live! There are only 25 spots, so sign up ASAP! If you have any questions, e-mail Amanda at comogirlsrock@gmail.com! CoMo Girls Rock is coming back for our 4th annual summer camp!! Camp dates will be June 6-11th, 2016. Stay tuned for more information for campers (hint: keyboards!! ), but for now we are looking for volunteers! Check out the volunteer application for more information and please sign up by April 1st! **poster designed by Delia Rainey! ** print it out, color it in, pass it on! Comments Off on Camp Dates + Volunteers! Camper Showcase at The Blue Note! 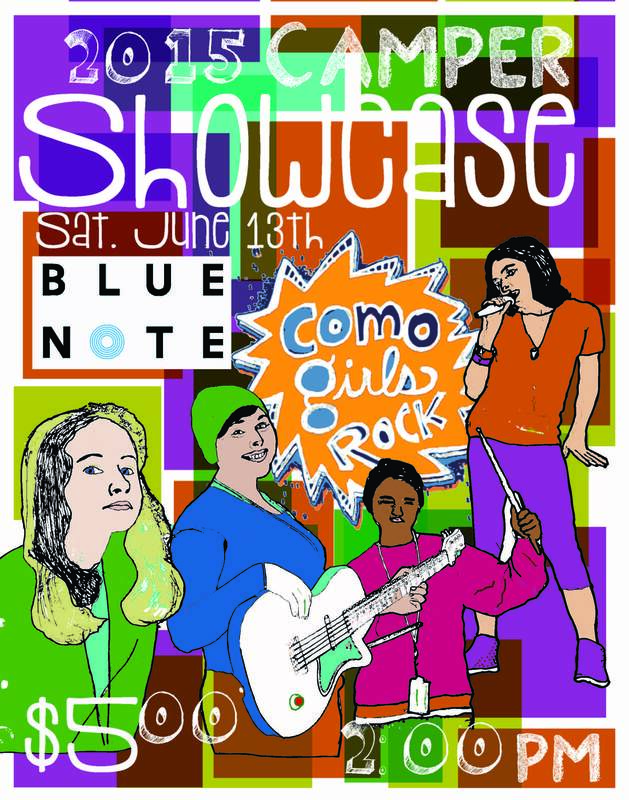 The 3rd annual CoMo Girls Rock Camper Showcase is Saturday June 13th at 2pm at The Blue Note. Don’t miss this amazing and empowering show featuring camper bands playing songs they wrote in just 5 days!! Buy tickets to the 2015 Camper showcase today and RSVP on Facebook! Comments Off on Camper Showcase at The Blue Note!